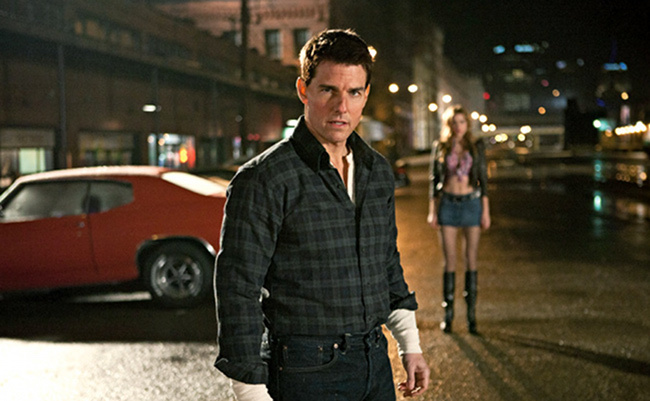 Tom Cruise in "Jack Reaper"
Australian business tycoon James Packer claims the 'Mission Impossible' star helped him get through his darkest days when he was millions in debt, his marriage was in crisis and his weight ballooned. James, 45, paid tribute to the Hollywood star, 50, during an interview on Australia's Seven Network on Sunday, saying: "When I was at my lowest, Tom Cruise reached out to me. He believed in me when other people didn't." They became good friends in 2002 after the businessman, whose mobile phone company One Tel went broke, joined the Church of Scientology and he is extremely grateful for their close bond. He said: "I'd met him once or twice...and he was in Australia and we got together. I think he could tell that I was in pain. He invited me to go to his house to go skiing with him at Christmas. "And he never asked me for anything, in our entire life. He believed in me when other people didn't. I'm very grateful. I just think he's a very special person." Fellow Scientologist John Travolta, 58, previously claimed he helped heal a car-crash survivor through Scientology. The 'Savages' star said he prevented a man from suffering severe pain after injuring his ankle in a car crash by using a Scientology procedure called "an assist". He said: "People were standing around watching as I did them. You could actually see him confronting the pain and after a while he looked up at me and said, 'I feel better,' so I said 'Okay, end of assist.' He had gotten noticeably better and I was chomping at the bit for more."